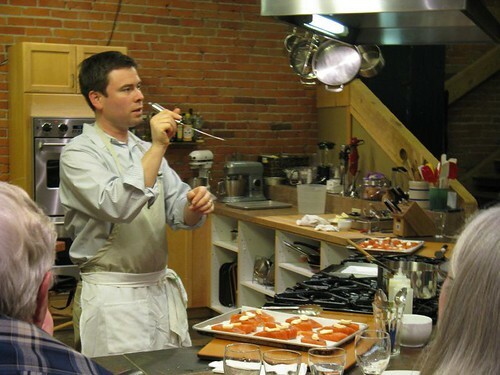 Last week we helped out at a great cooking class: Casey Schanen from Nell Thorn restaurant did the cooking and Renee Stark of Noble Wines brought the wine. The theme was polenta in different preparations, which sounds like it would be repetitive, but in fact it was fabulous. Not a surprise, of course – Casey’s cooking is always fabulous. We didn’t start out with polenta immediately. 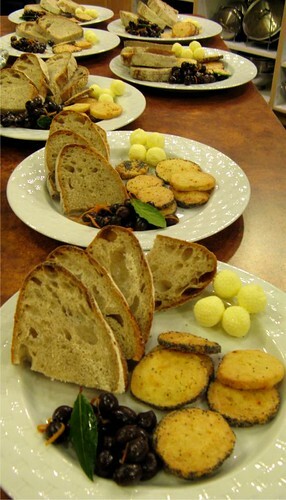 Casey likes to bring an assortment of nibbles with him, so we assembled a bunch of plates for the guests with marinated olives, cheesy wafers, Nell Thorn sourdough bread and butter. I think putting out the nibbles is a great idea, it keeps the guests from getting antsy while the first course is being demonstrated (the classes start at 6:30 and sometimes no food gets served until 7:30). 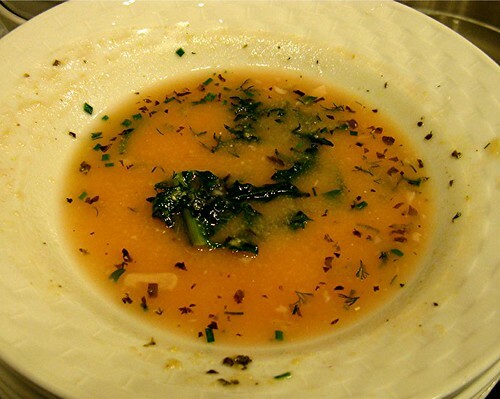 The real first course was polentina with winter greens, which was a very simple-sounding soup made with water, cornmeal, garlic, salt and a handful of mixed greens from Frog’s Song Farm. I only got a little bit of this but it was surprisingly tasty – I may try a version of it at home some day. Renee brought bottles of Barnard Griffin’s Sangiovese Rose, which is a lovely food wine and would have gone with everything we were cooking that night. For the second course Casey had gotten his first halibut of the season, cut it into small fillets, pan-cooked and then roasted them. They were set on top of soft polenta that had been beaten with plenty of butter, some fresh herbs and a good splot of plain whipped cream. 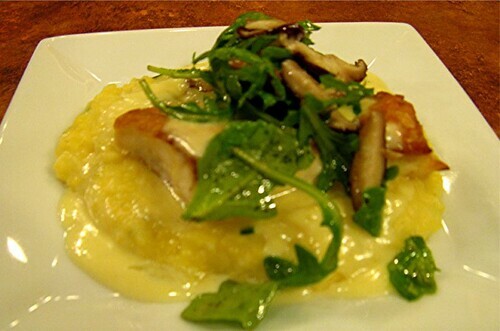 The topping was a salad of shiitake mushrooms marinated in a champagne vinaigrette and mixed with fresh arugula, and the sauce was a brie fondue. The parts of this dish all sounded unlikely to me, and I wish the photo had turned out better, but you’ll have to trust me – the final product was one of the most delicious things I’ve ever eaten. The wine was a Pinot Gris from the brand-new Mercer Estate winery in Prosser. 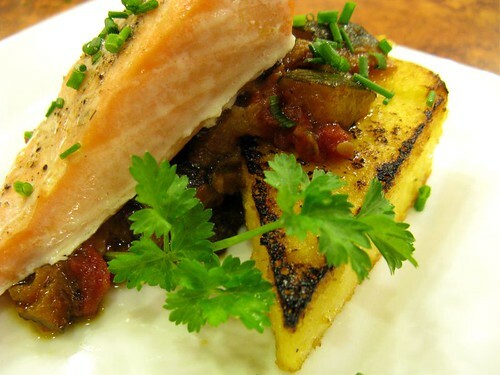 Unfortunately for me (I fill up fast), the third course was wonderful, too – salmon fillets roasted with butter, set atop triangles of fried polenta and dressed with a fresh zucchini “caponata” that was a wonderful taste of high summer. I was too full from the halibut to finish my plate, but the salmon was delicious. It was paired with Bogle Pinot Noir, one of my favorite affordable pinots. The evening finished off with little chewy cookies. Everyone else adored these, but they were too almond-flavored for me. I hardly needed dessert, though, after all the fish and polenta. A fabulous meal.